"It's not something North Korea wants us to do. We are doing this with an eye toward the future when the two Koreas unify," Monsignor Matthew Hwang In-kuk, the Episcopal vicar of the Pyongyang Diocese, said in an interview with Reuters on Thursday. Communist North Korea, which Church officials estimated had a Catholic community of about 55,000 just before the 1950-53 Korean War, does not allow priests to be permanently stationed in the country. The five candidates began studies a few days ago for the priesthood, Monsignor Hwang said. The Church plans to recruit a new group each year. It will take about 10 years to complete preparations and even then, they may not be allowed into the North. Priests from the South do occasionally visit the hermit state, usually to accompany the delivery of aid or the start of a humanitarian project, and a visiting priest reportedly celebrated mass in Pyongyang when Pope John Paul II died. There used to be about 20 priests in the Pyongyang diocese, which was incorporated into the Seoul diocese in 1970. The priests worked in the South but only seven of the group are still active, including Monsignor Hwang, who was born in Pyongyang in 1936 and fled North Korea during the Korean War at the age of 14. "At the time when the Pyongyang diocese was incorporated into the Seoul diocese, it was a precondition for priests like myself to go back as soon as the two Koreas unify," he said. The same applies to the five who just entered training for the priesthood, who are not been given any special preparation for serving in one of the world's most isolated states. The Church in South Korea launched a new push into the North about three years ago when the Vatican named Nicholas Cheong Jin-suk as the new cardinal for South Korea. He also serves as the apostolic administrator of Pyongyang. Although the North says it protects religion, the U.S. State Department said in a report in 2008: "Genuine religious freedom does not exist." It quotes defectors as saying the North executes and arrests members of underground Christian churches. The North built several churches, including a Catholic one about 20 years ago to show it allowed the practice of religion, but human rights groups have described the move as "a sham." 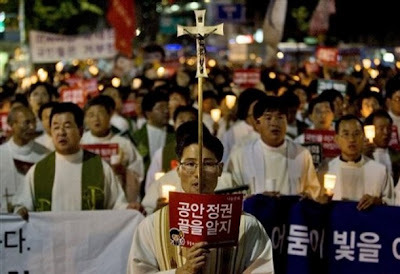 The South Korean Catholic Church will not say what it estimates to be the Catholic population in the North but outside groups have said it numbers in the few hundreds to about 4,000. There are about 4.5 million Catholics in South Korea, which has a population of about 49 million and one of the largest percentages of Catholics of any country in Asia. During his life, Cardinal Kim, who was also the apostolic administrator of Pyongyang, tried in every way possible to increase ties with the Church and population of North Korea, and to send priests there. Now it is hoped that these seminarians, once they have become priests, will be able to return to their country. The Mass and ceremony of admission were presided over by Choe Ki-san, bishop of Incheon. Meanwhile, a few weeks after the death of Cardinal Kim, the wave of emotion and devotion prompted by his death is not subsiding. Bishop Peter Kang U-il, president of the Catholic Bishops' Conference of Korea, tells AsiaNews that "it seems that the Holy Spirit is doing surprising things through the late Cardinal Kim. Catholics, non-Catholics, and believers of other religions feel the same love and thanksgiving for him deep in their heart. Husbands who maltreated their wives because they go to church, those who were indifferent toward God and who stopped going to church have changed their mind by watching the life of the late Cardinal Kim and what he has done. They began to go to church and knock on its door. Many people say, 'we want to live like him and do what he has done for the poor and the rejected in society'. The late Cardinal Kim is smiling warmly from heaven on our dark society suffering from all kinds of difficulties, especially the financial crisis. This is like the rays of the sun amid dark clouds." Many have also been struck by his last gesture, his donation of his eyes for transplant. According to the Ministry of Health, Welfare and Family Affairs, there is a long wait in the country for those who need transplants: an average of 41 months to find a heart donor, 52 for lungs, 62 for corneas. The number of patients on the waiting list for transplants is growing: from 2,840 in 2000 to 10,717 in 2008. But Cardinal Kim's gesture has also led to an eightfold increase in the number of people who say they are willing to donate their organs. Famous figures like the singers Park Jung-ah and Seo In-young of the pop band Jewelry have said they will do this.